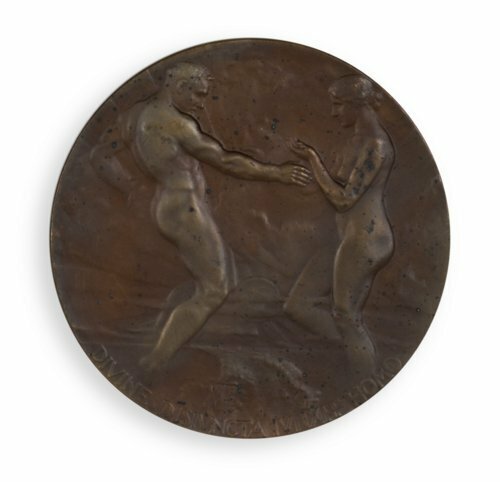 This bronze medal was made for the Panama-Pacific International Exposition. The exposition, held in San Francisco, California in 1915, celebrated the opening of the Panama Canal. The canal was a massive American-funded construction project that connected the Pacific and Atlantic Oceans through the Central American country of Panama. The medal features two figures, representing the two oceans, grasping hands over the Isthmus of Panama. It belonged to Arthur Capper, Kansas Governor and United States Senator. Capper probably acquired the medal on July 19, 1915, while attending a reception given in his honor at the exposition. Designed by sculptor John Flanagan, the medal was awarded to dignitaries or given as a prize. The Latin inscription reads "What God has Divided, Man Joins." The reverse side features the Tower of Jewels, the signature building of the fair.